Nokia Philippines is at it again, giving us a great deal this holiday season. We've had Nokia C3 and C6 on sale in the previous months, where we saw how many people wanted to get hold of these two models. 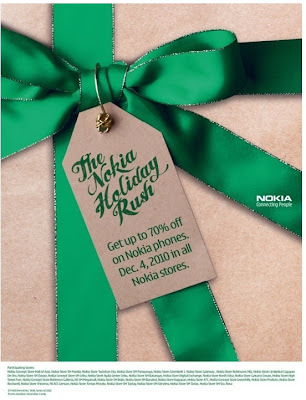 This time around, they're slashing up to 70% the regular price on more models, happening on December 4 (Saturday) and available at all Nokia stores nationwide. Their ad doesn't say a specific time, so I guess it'll run for the whole day. Nevertheless, there will surely be build up of lines, especially that the Philippines is known to be a Nokia country. Purchase is limited to one (1) device per customer and open for cash or straight transactions. Only newer models are listed above, but older ones may have discounts as well. For more information about the amazing features of the participating devices, visit www.nokia.com.ph.